Avare (sounds like “aware” pronounced “avAir” ə-ˈver) is a free aviation situational awareness moving map aviation GPS app developed in Boston, and donated to aviators and open source programmers. There are no push ads, no special permissions, and no hidden charges or subscription fees. Avare is adding new features very rapidly, so please see our Play Store page for a more complete list. You can also visit our Avare YouTube Channel for videos. Basic features include offline (after download) A/FD, Approach plates, and GPS moving map on all FAA VFR Sectionals, WACs, TACs and other charts, GPS location on IFR Plates & Airport Diagrams. Avare also enables manual browsing of all charts and all other materials even with GPS turned off. Current FAA weather METARs, TAFs, TFRs, and Flight Plans are provided too, along with a detailed Near list of airports, live 3D terrain or chart view and other extras. Permissions required include Internet access for downloading free current FAA materials and information, SD card access for storing materials, Bluetooth for new features like ADS-B, and GPS location to provide the moving map feature. Check out the free open source AddOn Apps we are creating to extend the capabilities of our Avare aviation GPS & EFB app. With these AddOns you can use external ADS-B and/or GPS receivers, or use a secondary Android device to extend and enhance the capabilities of Avare. We’re using this AddOn approach so that users who only want the core functions of Avare, can avoid any increased need for updates or storage space. As with Avare, all our apps are free and open source, with no annoying push ads or invasive Permissions. Notice: Avare is not an FAA certified GPS. Be aware that Avare is in the same category as all apps for portable devices like tablets and phones of any brand. See our FAQ for more details and links to some relevant FAA documents. If you’re a pilot who ever wished for a free collection of current FAA materials and information on your phone or other Android device in the cockpit, right now is the time to install Avare. To visit the Google Play store page for Avare where you can read Reviews and Install Avare, just Click here with your Android device. Online or offline moving map FAA charts with the ability to download only the charts you choose, online or offline browsing of all FAA charts with or without GPS; ground track bearing, plus GPS speed and altitude; distance, bearing, projected track indicator line, and ETA to the destination; destination A/FD and optional Airport Diagrams; plus bearing and distance to any point on the chart simply by pressing one finger on that point. Display options include Landscape and Portrait mode, plus North Up or limited Track Up. All the Avare apps and all features are free. Avare works on most Android devices (note: devices without GPS or other hardware may be rejected by Google Play’s Install, though we offer a manual installation option for such devices). Some devices will work even better with an external GPS (using our free Avare External I/O Plugin app), including WAAS capability and many ADS-B receivers. Avare works on many older Android devices although of course best results and some features like the “PFD” benefit from newer devices, and an inexpensive external Bluetooth GPS may improve reliability and accuracy. Some users prefer the larger screen area on a tablet device. 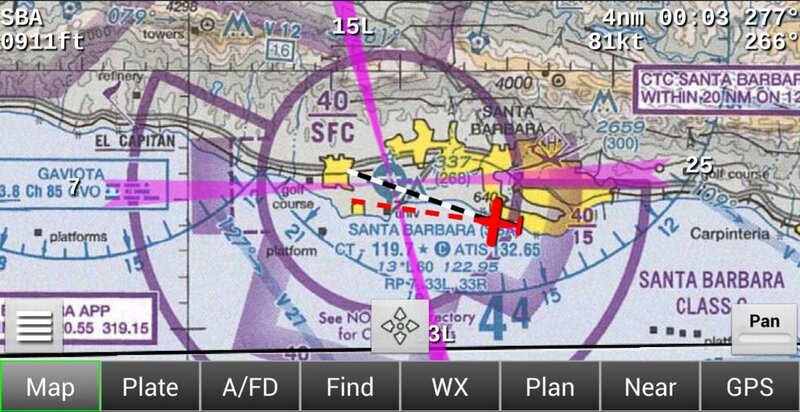 The fact that Avare was designed for and runs fine on a minimal early Android device means that on newer devices it’s even more responsive and easier to use, and with a 4″ or larger screen it’s much easier to use and read in flight than a paper chart or similar size FAA certified panel GPS. For more details about Avare, please see the Help page on this website or just install the latest version and discover for yourself how useful Avare is. To visit the Google Play store page for Avare where you can read Reviews and Install Avare, just Click here with your Android device. Be sure to watch the Play Store for the latest news and updates, check (or sign up to Follow) the News section here for occasional announcements of some new features, or just install every Update, because features and refinements are added frequently. We sincerely welcome feedback on all aspects of our products so please consider joining our Forum to share your questions, feedback, feature requests, or how you use Avare. On the Forum you’ll also find the very latest on new and planned features. Note that for a time we tried to offer Avare on the Amazon Android store, but after extensive problems with them (including them deleting Avare without notice), we have stopped trying. We do want to help users of all Android devices including the Kindle to get Avare working on their devices. If you can’t install on Google Play, please see our Manual Installation page here. Please take a moment to let everyone know on our Forum, whether or not you’re able to use the Manual Installation on your particular device. If you like Avare and find it useful, we invite you to join the aviators supporting our free apps. Please contact us if you’d like to volunteer your services. Note that any negative feedback in a published Review rather than on our Forum might discourage other pilots from trying our products, and given that they’re free and improving very rapidly we hope you’ll join us in encouraging pilots to try them out. All feedback allows us to gauge features of most interest, and to learn of and fix any problems. We are an all-volunteer group, and we invite you to join us by getting in touch. To save time and better serve all our users, we prefer to communicate with you via our Forum. Please contact us via the Forum and we’ll try to respond quickly. If you’re willing to help us and other users by replying to questions from other users on the Forum, it will help everyone. We also invite you to post photos, tips and tricks, stories, or links to videos there about how you use our apps. We welcome any and all feedback or questions on any of our products, and it’s most helpful for our team and other users if you use our Forum to reach us. Thanks! Click here to visit the Apps4Av Forum where you are of course welcome to read anonymously without joining.